Did you know that fall is often considered the best time to seed? Our lawns are often in need of repair from the summer. Drought, weeds, insects, and fungus have all left their marks on our lawns this year. That is why taking corrective action to repair these portions of the lawn now means that we will have a stronger, more beautiful lawn next spring! Why is fall such a great time to seed? Typically homeowners see great success in the fall and it is really two-fold. 1) Soils are already warm from the summer months, unlike the spring when air temperatures can be misleading as to what the actual soil temperatures are. Grass seed needs soil temperatures to be around 55 degrees to germinate, however warmer is always better! As of early September Soil temperatures currently in the Pittsburgh area are about 61 degrees F. 2) Rain fall is more frequent now that we have reached September and that means less watering with the garden hose! This is probably the number one reason that homeowners have poor results when planting grass. It is very important for your grass seed to be kept moist. So much so that watering twice a day is not uncommon; especially if you are attempting to seed in the middle of summer. With more frequent rainfall, the workload necessary to water newly seeded areas is reduced tremendously. Also, the cooler days and nights means that your seed will not dry out so quickly. 1. Remove all dead grass and loosen up the top inch or so of soil. You must create good "seed to soil" contact so that new seedlings have a nice soft bed of soil to plant their tender roots. Many people will need to top-dress their bare spots with fresh top soil in create the most ideal conditions. 2. Consider covering up grass seed with a moisture retentive material such as peat moss. 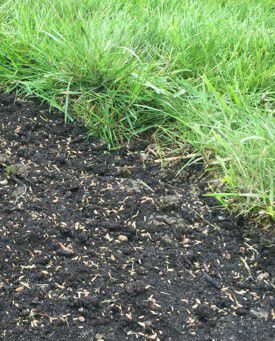 I have attempted grass seeding with and without this step and the results with peat moss are far, far better. Peat moss is very lightweight material that holds moisture better than soil and prevents grass seeds from drying out so quickly, so we strongly recommend this step. 3. And finally, if you have large shade trees in your lawn, you may want to consider reseeding in the early parts of spring. Spring is often better in these situations because leaves will not be falling onto and covering up delicate grass shoots. Plus, in early spring there is often a 4-6 week window where trees will not have filled in completely and areas that are typically shaded will receive a partial day of sunlight!